1 pinch freshly chopped dill. Recipe: Slice the zucchini to rings with thickness about 1/4-inch. Mix the rest of the ingredients in a mixing bowl and stir well. With a pastry brush apply some of the dressing on the bottom of a large baking dish. Spread the sliced zucchini in the dish and brush some more dressing on top of them. Keep the rest for later. 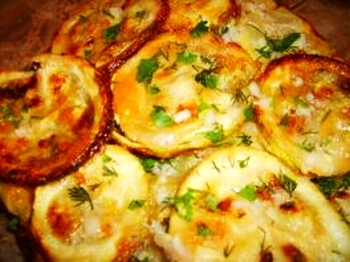 Bake the zucchini in a preheated oven at high temperature until the top becomes a little caramelized, about 15 minutes. If you are roasting the zucchini in a convection oven, you can put a sheet of parchment paper on the bottom of your baking tray. Remove the roasted zucchini from the oven and let them rest for 5 minutes before removing them carefully from the dish with a kitchen spatula. Drizzle the rest of the dressing over the roasted zucchini before serving. This recipe can be used as an appetizer as well as a side for a main dish.